Blam is one of the most user friendly RSS feed reader in Ubuntu. Blam can manage both Atom or RSS feed. You can read many sites without visiting them anymore. You can subscribe to any number of site, print the pages out, and set custom update intervals. It is created for GNOME environment. So, it will match your Ubuntu Unity. 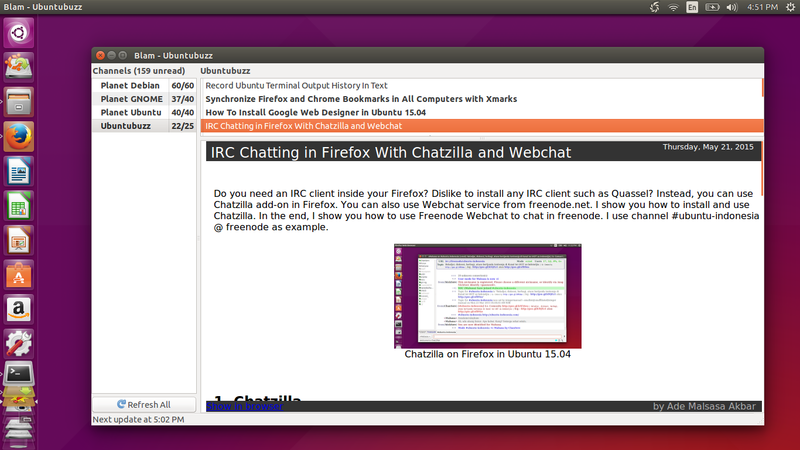 By GUI, you can look for it in Ubuntu Software Center. By Terminal, use command below. For first usage, press Reload to redownload all built-in RSS subscriptions. To add your favorit RSS feed, insert it by menu Channel > Add > paste the RSS URL and name it > OK. For example, you can use Ubuntubuzz RSS Feed or Atom Feed. To remove a feed, right click on the entry on the left panel > remove. To set interval time, open Edit > Preferences > set the value on the second line.